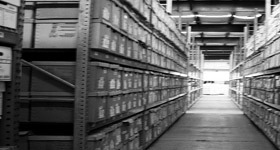 Companies just beginning to work with document storage companies often have questions about their box sizes. This is an important question to answer since, with vendors who charge by the cubic foot, the size of your boxes can have a significant impact on your costs. There are three standard box sizes used for storing documents. boxes are approximately the size of a copy paper box. 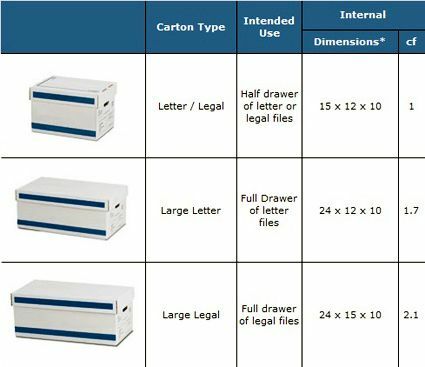 These boxes, which are by far the most commonly used, will hold letter documents width-wise or legal documents length-wise. The dimensions of these boxes are roughly 15 x 12 x 10 inches. boxes are for storing letter documents only, and are roughly 50% larger than a Letter/Legal box. The dimensions of these boxes are roughly 24 x 12 x 10 inches. Some records management companies that bill by the cubic foot charge these boxes as 2.4 cubic feet even though their actual measurements are closer to 1.7 cubic feet (a 40% markup). boxes are for storing legal documents only, and are roughly twice the size of a Letter/Legal box. The dimensions of these boxes are roughly 24 x 15 x 10 inches. Some records management companies that bill by the cubic foot charge these boxes as 3.6 cubic feet even though their actual measurements are closer to 2.1 cubic feet (a 71% markup). Attached lid ensures your documents are always covered and secure. The hand holds are double walled. Top tab indexing for files. A reference area is located on the front of the box to mark the contents. A reference area is located on the front and back of the box to mark the contents. Side tab indexing for radio-graph folders (commonly used in the healthcare industry). Top tab indexing for fetal monitor strips and microfilm. A reference area is located on the side of the box to mark the contents. All boxes kept in stock for easy and efficient ordering. No minimum order quantity required. Volume pricing is available. Delivery fees may apply. Video on storage boxes explained, click on image below!